November’s wage is always low for me. It turned out to be the third lowest I received in 2014. My overall income had a boost from other sources. It was my Birthday on 5th November, and I received some money from my family. I used to spend half and invest half, but recently, I’ve been investing everything. This year is no different. I plan on investing this money on a NEW income generating venture I’m exploring. I’m going to trying something out for the first time and I have no idea how fruitful it’ll turn out. I plan on writing a post on it soon so you can track my progress with that. My dividends for November were high for me. I’ve kept the money in my broker account and I’ll use it to invest with when I get paid later this week. I had another decent month of Ebay sales and a small payment from Topcashback which all made up for the lower than normal salary. I had a really low month for spending in November. This was partly down to the lack of one off expenses, and my recovery from surgery. My Mortgage/House Bills, Food Account, and mobile payments were standard for me and I didn’t spend any money on petrol or birthdays. It’s my brothers birthday 2 weeks after mine, and I had a chat with him to see what he wanted. After a few minutes we both agreed to knock presents on the head this year. We were both interested in saving money, and we weren’t sentimental about celebrating our birthdays. Some of my friends think this is a little weird, but we’re both cool about it. What do you think? My groceries were in line with last month, which is an average amount for me. I was recovering for 3 weeks in November after my operation, during this period I bought more smoothies and fruit than I would normally, so my groceries were higher on the back of this. I didn’t spend any money on alcohol, eating out or fast food. This is a first for me! I went out to the local coffee shop twice which made that spend a little higher than normal. We had our annual boiler service, which is getting a little bit cheeky nowadays – £125! Miss FFBF and I also split the cost of a wedding gift for my friend who’s getting married this Friday. We celebrated Children in Need at work by dressing up as superheros on the 14th November. We all have vices, and one of mine is Fancy Dress. I don’t know why, but I love making an effort for these events. I think it’s partly because I don’t go out much nowadays, so when we do go out, I go for it, especially when there’s fancy dress involved. At last years Christmas Ball, we had a Rocky Horror theme and I went all out as Dr Frank N Furter. It freaked a lot of people out! 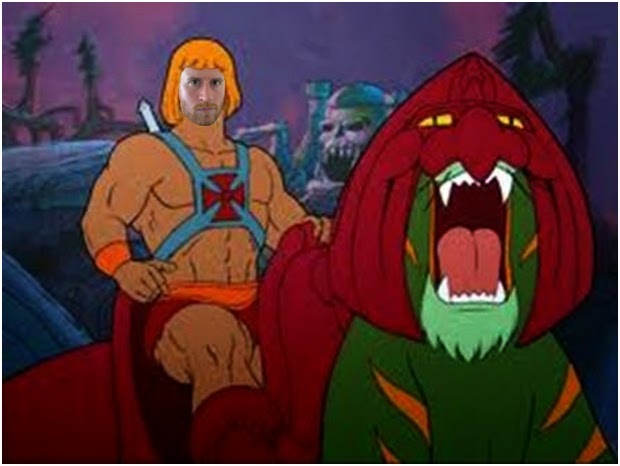 When I was searching the internet for a superhero costume, I came across a He-man one. I HAD to get it! It was a muscle suit, boot covers, sword and of course….. the hair! I didn’t tell anyone at work, I was purposely playing down my efforts this year saying I had a lot to do, and I would see if I had time to get something. Low and behold, the hospital called in the first week of November and asked if I was ready for surgery on the 6th November to remove my Gall Bladder. Ahhhh! I was more gutted about missing the fancy dress than the surgery itself. The surgery was a success but I wasn’t in a fit state to dress up that day. I was having trouble sitting up, never mind putting a musclesuit with no pee hole. I’ve stored the outfit for another day. I was going to send it back or sell it on ebay, and I couldn’t. I have to wear it at least once before selling it on. My average spend at the end of October was £825.68. After a low month, I’ve managed to reduce the average by £12.52 to £813.16. Unless a significant event happens, I’m extremely likely to keep my expenses below the £950 per month average. My spending would need to be more than £2,181. I don’t think I can get it below £800 for December, as it’s going to be an expensive month for me. I’m yet to buy Christmas presents, I have a wedding to attend, two Christmas parties, as well as the usually social gatherings that come up at this time of year. I’m not going to stress about it either. I’ve had a great year, and I’ll have some fun this month! I saved and invested 69.2% (£1,247.67) of my income this month. My average for the year has now decreased to 70.1%. I’ve previously admitted to wanting my average to be above the 75% mark, but that isn’t going to happen for me this year. The percentage has steadily dropped over the last four months, and I’m now clinging on to 70% if I can. I would be delighted with 70% for the year, so that’s my aim for December now – 69% and above, wish me luck! How was November for you? Are you still on track to meet your goals this year? How do I look with a with an orange bob? 69.2% saved/invested this month is awesome. You've really got your spending nailed in a way that I keep revisiting my own to see what I can realistically lose. I don't have my own blog, so excuse me for using yours as a "confessional" but November was a disaster for me at 48% saved/invested. A couple of one off huge spends on things I consider essential, but by 3rd world standards, even 1st world, are ridiculous. I'm so glad you elaborated on the fancy dress, because I love fancy dress, and go all out, no detail spared, and have an emergency outfit for any occasion. I'm sure you'll get a chance to wear the H-Man outfit, New Year is round the corner, just wear it anyway, whatever the occasion! That orange bob cannot go to waste under any circumstances. Birthdays – I don't think it's at all weird that you and your brother decided not to exchange gifts, you don't need to receive or give a physical thing to celebrate a birthday, especially if it's something neither of you need/want anyway. I have 2 friends that I used to exchange Christmas gifts with and we've made an agreement that we all donate about £25 each to the charity of our choice (I've done Crisis at Christmas & RSPCA this year). So they get the confirmation of who/what they've helped in their Christmas card, and everyone feels much better about how the money was spent. I'd honestly be happy if that's what I got for Christmas/Birthdays from everyone. Good luck with the December parties/Christmas spends. Enjoy it and you're right, don't stress it, it's fun time. Hey Huw, I'd have thought with all that weight-training you're doing, you wouldn't need the muscle-suit? 😉 Anyway, I loved that pic, He-Man used to be one of my favourite cartoons when I was a kid! You've done a brilliant job on keeping your expenses down so splurging on things that you get enjoyment from, eg fancy dress should be allowed! Even if you can't keep to an average savings rate of 70%, you've more than crushed your original target of 50%! So let your hair down (the He-Man hair, hehe!) – I'm sure you'll find an excuse soon enough to wear the suit, so it won't have gone to waste! My family and friends are still in both birthday and Christmas present-giving mode. Over the years, it's gotten more expensive as my sisters have kids. I'm currently just resigned to the fact that I have to continue to account for spending a lot of money on these occasions. Starla – it's all relative mate, 48% is still ridiculously high compared to most of the population remember, so don't get too down about that. Like the charity idea as well, it's something I've asked a few people for this year. We've had some really naughty months this year but a lot of it is down to moving house (so I keep telling myself). I need to publicly put some of this on my blog to give me (and the Mrs) a kick up the bum though, as I think it really works, well it is in your case that is for sure! Full disclosure is the way forward! Anyway just to join in with some figures, fortunately things got back to being a bit better last month and our November savings rate was 59%, which I think is about where it should be going forward. I would love to get to 70%+ but without some serious cut backs on certain things I find fun, it ain't gonna happen. Not saying it never will, but for now… I am (very) happy with 60%. Thank you for your kind words. I'm so pleased to hear that my Blog helps you in some way. You're more than welcome to use it as a 'confessional' for as long as you like! I think 48% is still very good, and anything over 50% is great achievement. ha ha. I'm glad I have your backing on the fancy dress. I just can't help myself! You're right, the orange Bob is way too good to go to waste. I'll be sure to post pictures when I wear it! I love your suggestion on Christmas gifts, it's a great idea. I think it represents more about what Christmas is really all about. I had the wedding yesterday/last night, and it was fantastic! I plan on continuing the fund times this December. I hope you have a fun filled month too! Thanks again for stopping by, and sharing your saving rate and thoughts. ha ha. That made me laugh! I loved He-Man too. I've lost just over a stone in bodyweight (and muscle) since the operation, so maybe I'd need a suit now! Thank you Weenie. I've had a great year on savings rate. I have a feeling that 'm going to struggle to save 70% this month, so it might fall short. I'll have to see how my spending goes. My spending could be the highest it's been all year! I have 3 nephews who LOVE Christmas, so my spending had gone up. I'll see if any of my family want to give it a miss this year to save some money. I currently save money every month of the year to account for Christmas presents as it used to take a big chunk out of my December wage previously. A great month, I real do have to try and reduce my spending, as I can't get near some of your numbers. I think I stilt have an overhang from my consumerist days, still live in a house much bigger than is required for two with resultant higher costs for utilities, rates etc. Looking to sell and downsize next year so will reduce costs, but also free up equity to invest for the future. As a note for Starla, I reckon 48% saving is probably more than at least 95% of the population, and if well invested is a great base to build up an income stream (your progress is a demonstration of this). Keep posting so we can keep following your rapid progress. It does seem a bit odd having a strict approach in so many areas, but when it comes to dressing up like a numpty, I lose all inhibitions! I've spent more money this month for our Christmas ball too. I have a problem! I agree with your point on Starla too. 48% is very credible, and most people can't work to those levels. I believe my full disclosure approach has helped me immensely this year. It makes you question every spend. I guarantee your 'non essential' expenses will be lower next year because of it! I 100% stand by that statement. 59% is very high, well done. In all honesty I think I might fall a little short of 70% for the year. This month is going to be a big spending one, and my wage wasn't as high as I was expecting a couple of months ago. When you move over to full disclosure, I'm sure you'll be eager to bring down some spends, you might even set some famous TFS challenges, which I'm sure will bring that 59% higher. As you say though, you have to be happy with the rate. You only live once and you need to be happy with how you live your life. My plan is too be more extreme in the early days. As my investment pot increases and compound interest kicks in, I'll loosen up the purse strings a little more. Thanks for sharing your thoughts.I enjoy the in-depth comments that you, Starla and Weenie leave! I'm glad you like my thorough approach. It might bore the crap out of some people, but it's the way I roll! I'm not sure why you're anonymous? Did you select the drop down option – 'Name/URL'? I'm glad you continue to enjoy the Income & Expenses posts. I appreciate the support too! I think it's great that my post can instigate some self reflection for you. That's a great compliment! If you're able to downsize, you're likely to find a substantial decrease in your expenses. The extra equity to invest with could also increase you income further – A win-win all around. I enjoy the challenge of cutting back, and if I'm being honest, depriving myself just a little bit. I think most people won't relate to that, but it does give me an advantage for reduced spending. However, I take great joy in reducing the easy cutbacks that you 'have' to spend money on like – Utilities, insurance, phone contracts etc. Most people can relate to that, but aren't always willing to take the time to shop around and check cashback sites for extra savings, or perhaps use cashback credit cards on essential spends. Once again 'm fortunate because I enjoy the process and get a lot of satisfaction from it. How about you,? I agree entirely with your point on Starla. I hope she's reading the comments from all of you guys. 48% is excellent when you compare it to the general population. It's similar to myself saying £70 per month in dividends is rubbish. It isn't a high amount compared to most people Blogging about Investing, but compared to the general public, it's actually pretty good. Thank you again for stopping by and offering your support. I look forward to reading about your downsizing progress next year, and hearing about all of your wonderful savings. All the best! Thanks Huw for Blog encouragement. I've left similar comments over at Weenies November Expenses page. Work is in progress over the next few months. Standby! Going back to the fancy dress, I know where you're coming from on this, I'm generally pretty lo-fi, but when it comes to fancy dress there's simply no holding me back either, it's like an unstoppable force! I'd go as far as to say Mrs FFBF needs to dress as the He-Man Tiger creature for the ultimate duo effect. I'm not sure if this is a recognisable "problem" but who cares! £49.96 well invested. Or maybe she could go as She-Ra! Great to hear that Starla is interested in starting a Blog! Please let me know if I can help in any way! Congrats on an awesome month though – 70% savings is fantastic! I reached a 47.5% rate for the first time in November – it's increasing slowly as my passive income increases so I'm happy about that. Thank you very much, and congratulations to you. 50% is well in sight for you now. I'm happy with the rate I have right now, and like you I hope this slowly increases over the future months and years. Yes I'm reading, taking note and laughing at myself and the furore I've caused by bowling on here to announce my "disastrous" 48% 🙂 On reflection, it was an over reaction, however, in present company I'd go as far as to say I was embaressed, ashamed, and feeling positively frivolous and debauch with my spending! You are all absolutely correct and back in the real world this is a terrific saving rate. I love 48%. 48% rocks. I shall say no more about it. ha ha. Nice reply! 48% does rock and so do you!